Tastes tend to change and I wanted to revisit an old beer that I had sampled back in 2008, but had yet to give it a formal review until now. Today's beer review comes from one of the fine breweries in Boulder - Twisted Pine Brewing Company and is called Twisted Pine Raspberry Wheat. I was looking for a sessionable beer with a little something different and bought a six pack of this at my local store. 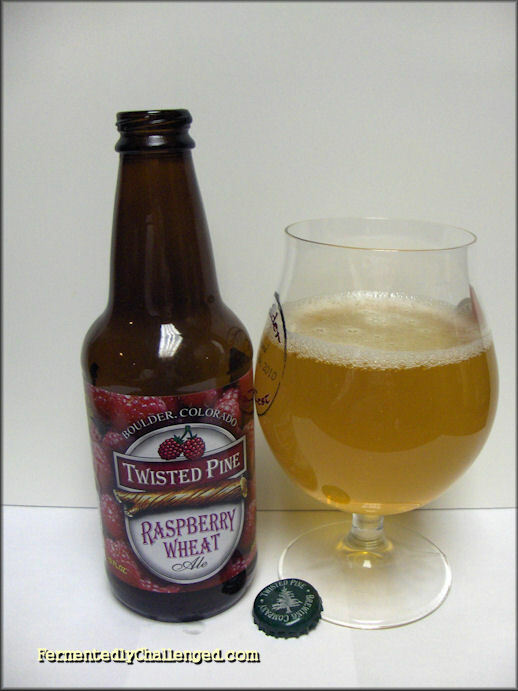 Twisted Pine's Raspberry Wheat weighs in at 4.8% ABV and has a very low bitterness rating at 10 IBUs. The beer was made with all natural ingredients including Willamette and Northern Brewer hops. I'm usually not a big fan of fruit beers, unless it happens to have some sour in it. Now granted, this beer isn't a sour beer, but I'm always willing to try something at least once (or in this case twice) to see if I can appreciate. Appearance: The Raspberry Wheat poured looking like most common wheat beers, pale yellow, slightly cloudy and with a modest near-white head. The head dissipated rather quickly, but left just a small 1 to 2 bubble thick head on the top of the liquid. Swirling the beer created a lot of nice lacing that quickly slid off the sides. Being a raspberry beer, I half expected this to have a slight reddish tint, but there was absolutely no color added from the fruit. Aroma: Yes, there was definitely a big bouquet of raspberries in this beer along with what I call the "wheat funk" that I normally find in most beers like this. It's hard to tell whether this beer got all that raspberry aroma from actual fruit or whether it was from a concentrate. Either way, if you're looking for a big raspberry nose in a beer then this beer won't disappoint. Taste: Served cold, this beer started off with a sweet raspberry taste up front followed by a big wheat beer taste going down. There was very little bitterness in this beer, yet just enough to remind you that this was indeed a beer and not some fruit juice. Closing my eyes and drinking this in enhanced the raspberry experience even further. Otherwise, the pale yellow color might fool you into thinking this was something else. If this beer would have been made with darker malts, say with a Dunkelweizen, or perhaps even with a bit of Brettanomyces, I think it would have been even better and a more believable raspberry session ale. Overall: Fruit beers like this one are OK on occasion, yet not one of my favorite styles. Still, I had no problem finishing off a beer or two of this. It's just refreshing enough to satisfy and doesn't have too much fruit to mask the beer itself. I'd give this an average to slightly above average on the rating, but nothing more. Try this one as a change of pace if you want a pleasant aroma and a slightly sweeter taste. - Get Medieval this April with Twisted Pine.